It’s advantage Kirkham Junior Reds ahead of their Hogan Cup Under-13s final meeting with Poulton Town after they came from behind to win the teams’ Blackpool and District Youth League encounter 2-1 and keep their title bid on track. Poulton led for much of this top-of-the-table contest at Thornton Sports Centre but couldn’t prevent the Reds turning the match on its head in a close encounter which whets the appetite for their cup showdown at AFC Fylde. It was Kobe Moore who gave Poulton the upper hand in the first half with an unstoppable free-kick . However, manager Steve Malone admitted they didn’t really threaten to add a second as Kirkham eventually turned the tables. The visitors got a grip on the contest in the second period, looking dangerous on attack and neutralising the Poulton goal threat. Liam Geraghty is Kirkham’s top scorer but on Sunday morning he turned provider as his passes set up both Kirkham goals, Theo Cunliffe firing the equaliser before William Trow made his side’s pressure count with the winner. Steve Malone’s Poulton side haven’t won on any of the three occasions they have featured in AllStars this season but they will have a further opportunity to improve that record. Steve said: “We’ve completed our league campaign now and we’ll probably finish third. 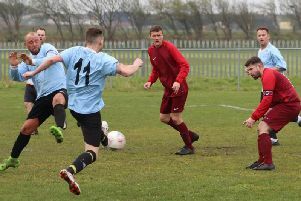 With league games still to play, Kirkham boss Lee Geraghty’s sights are very much on a league and cup double, though he knows the clash against title rivals Blackpool Rangers Tangerines will be crucial. The Poulton man of the match was central midfielder Alfie Douglas, who showed outstanding work rate and held the ball well. The Kirkham choice was Theo Cunliffe, who worked ever so hard up and down the right wing, causing the Poulton defence endless problems and taking his goal well.